Could you earn a living working from a shed? I bet your first instinct is, “No, gross! Mine is hot, dirty, and buggy.” This describes the most typical shed, but with the small space movement progressing at light speed, high-end "office sheds" are all the rage. Small living and work spaces in the backyard are no longer niche industries. Shows like Tiny House Nation or Tiny House Hunters document just how prevalent these types of expanses have become. Affordable, modular, and professionally installed varieties are all readily available locally and even on Amazon. Military spouses often work at home in whatever space they can cobble together, whether it’s a dining room table, a corner desk, or a laundry room with a computer. Wouldn’t it be ideal to have a portable office? Easier said than done given moving company and rental home restrictions of course, but it could work for those staying put for a few years. For those not on a military schedule for moving, shed spaces can alleviate the need for relocating out of a favorite neighborhood for more space. Mom or Dad would surely be very happy in their own luxury home office or getaway! This extra space has also been used for playrooms, guest rooms, and even what have been termed “pub sheds” for entertaining events in the backyard or just a relaxing drink after work. Hear that, home beer brewers? 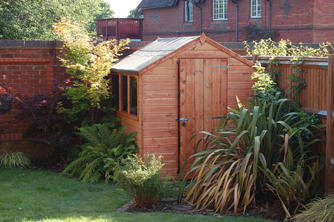 Designing a shed’s esthetics is much like picking finishes for a new home. Windows, doors, paint, roof line style, and many more options are available to upgrade, augment, or enhance basic varieties. Smaller sheds start at about 8 X 10 feet and can go to 10x13 and larger. Prices start near the $3,500.00 price point and rise with the additions of porches, bathrooms, or kitchenettes. As with all new construction, there is homework to be done. Zoning, permit, and tax offices all have a place in the shed building process. Review the city’s laws to see if shed work space is legal. The next crucial step is to decide which portion of the yard is the best location. Drainage, septic tanks, and expensive landscaping play a part as to where construction can begin. Research the manufacturer and shed installers for any complaints or unresolved issues from previous clients. Most companies will go out of their way to answer any questions and offer suggestions. Quality materials are essential to maintain the look and stability of the building. Wood construction compared to metal or plastic is more expensive, but far more reliable and sturdy. There are plans online for sale detailing the construction of a shed for less investment, but there are other DIY options: modular sheds and pre-assembled kits. Many companies will have professionals build the shed and perhaps lay the concrete pad if that option is chosen. A pre-built shed may be trucked into the back yard, but this requires easy access free of trees and shrubs along the entire path of the vehicle. 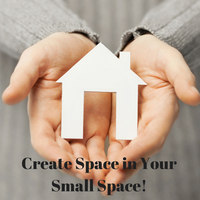 Decide exactly how the shed space will be used to plan for wiring, storage, and organization. Home offices will need to be light-filled and comfortable. Craft and studio spaces will need access to water and have easy-to-clean surfaces. Taking space-specific utilization to the extreme, Germany’s LoftCube builds portable office spaces on top of buildings or skyscrapers! Transient lifestyles are the mother of invention for military families. How does your family accommodate office space for at-home workers?